Ridley Heller thought that all her problems would be over if she could have Bo back; back from the dead. But what Ridley didn't know was that her wish would come at a price. Bo survived a condition that would have killed a lesser vampire, or any vampire for that matter. The only reason he didn't die is because of who he is, someone Ridley doesn't know at all. Someone Bo himself doesn't know at all. As Ridley gets closer to finding out Bo's true identity, she discovers that loving him could also come at a price, a price much higher than she ever could have imagined. The question is: is there any such thing as a price too high to pay for Bo? For his love, for his safety, for eternity in his arms? I have become the biggest M. Leighton fan! Between the Madly series, The Wild Ones and now this series I cannot believe how much I am loving M. Leighton' stories! She is an author that knows how to keep you on the edge of your seat. More than once in this book was I given a #BookNerdHeartAttack ! Best part of book: BO! Bo is the best part of this book. Hot, young and caring vampire is how I would describe Bo. Oh, did I forget to mention he is HOT! Well, he is! On top of that, he has very, very strong feelings for Ridley. At first, Ridley kind of got on my nerves and here is why: she was a follower. She did everything her friends wanted her to do and she saw right through them. However, she never stood up to them. Then one day she did and it was GREAT! See, Ridley has had a rough past few years and it was not until Bo came into her life that she began to see things differently. She was immediately pulled to Bo. (Um, hello! Hot vampire!) But it was more than that. Bo was there for Ridley more than once to save her and he would sacrifice anything for her! I do mean ANYTHING! Not so great about the book: THE ENDING! Talk about a cliffhanger. I was on the verge of throwing my Kindle across the room because I was so hurt/upset/mad (all rolled into one) at the ending of this book! But, after I tweeted M. Leighton she told me it would be ok and read book 2. 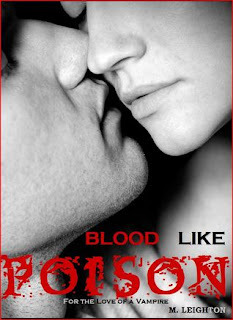 Why read this book: Ok, I know what you are thinking: hot vampire and a girl - been there, done that. WRONG! This has a lot more "story" to it then just love. Do not get me wrong there is love but the back stories and the character are much different than other Vampire/Human Girl stories!